Detroit Michigan Wedding Planner Blog: Does Anyone Have a Depend? Yes, you heard right! There are brides who are so busy on their wedding day that they do not have time to go to the bathroom! Or they have gowns that are so large and difficult to maneuver that they can’t get into the bathroom stall! Some brides are now just saying forget about the hassle and put on an adult diaper for the day! This allows them to just go wherever they are and slip on a new one within seconds, an all this without 3 ladies in the restroom trying to keep the dress from falling in the toilet water! For those of you who think this sounds like something you’re interested in they actually sell them! Online is the most popular and diverse place you will find them. They are actually called “Bridal Diapers”, but they are a little pricy. They tend to crinkle less than normal adult diapers and are more discreet. The brides who have chosen to wear them on their wedding day say that it saved them so much aggravation when making a restroom trip and found that they really didn’t notice them. They are most popular with brides who have extremely expensive or very ornate and complex wedding gowns. These brides just don’t want to ruin their dress and decide that a bridal diaper is a safe and very effective way to do just that. So if you are interested in purchasing or at least trying a bridal diaper here are a few sites and stores to visit! 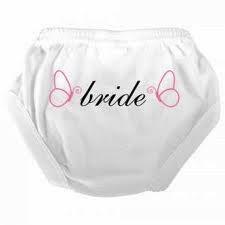 For those of you who would still like to wear a “Bridal Diaper”, but don’t want to spend a lot of money on one, any adult diaper will do the same. For example, Poise, Depend, and Tena are all great alternatives. So stay dry ladies! 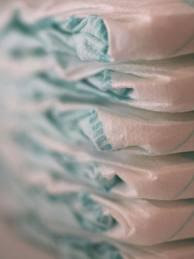 Check out these coupons http://www.therawfeed.com/stores/diapers-com.